Boving & Co, London (hydraulic engineers), Melville Dundas and Whitson (contractors) and J Sharp (consulting engineer) for Henry Ballantyne and Sons, Limited; started 1919 - operational 1922. Free standing, square-plan reservoir with subterranean 12in. cast-iron pipe leading to tall square-plan tower containing surge tank. Ferro-concrete with cast-iron pipes, all steel riveted. RESERVOIR: square-plan, ferro-concrete reservoir with tapered side walls (8 in. thick at top tapering to 14 in. in the upper 10 ft. 6 in before broadening to 21 in. at base) with reinforced concrete base. SE elevation formerly with advanced concrete lettering reading HENRY BALLANTYNE AND SONS, LTD KIRNIE LAW RESERVOIR (hole now blown through centre); overflow/sluice ramp to left of lettering; to far left, iron ladder leading to concrete viewing platform to top of angle (further ladder on other side leading down into reservoir). All other elevations plain except for a projecting concrete lean-to (which housed electrical recording appliances connected with the Barograph Recorder in the mill and showed, amongst other things, height of water in reservoir) at S angle and the outlet and inlet valve. INTERIOR: 192 feet square by 15 ft. 6 in. deep reservoir. 9 in. thick concrete floor slab (light reinforcement near upper surface) increasing to 18 in. thick approximately 6 ft. from inner face of walls; floor slab continues to form 2 ft. thick toe to exterior of wall (slab 21 in. thick under wall to 9 in. thick at outer point). Side walls heavily reinforced and tied to floor slab and given a fine plaster finish. SURGE TANK: tall square-plan ferro-concrete tower with projecting angle margins encasing surge tank; 9 inch steel riveted high pressure pipeline set within ground to front with pair of access man-holes with cast-iron covers (one now missing), lesser pipe adjacent to left. Kirnie Law reservoir sits in a saddle between the hills of Kirnie Law (1541 ft.) and Priesthope Hill (1802 ft.), 1000ft. above the mills it served and on the lip of the Walker Burn. The Ballantyne family owned Tweedvale Mill in Walkerburn since its construction in the mid-19th century. A rival mill, Tweedholm (also in Walkerburn) was bought by them in 1918 and it was decided a more efficient means of producing power for both mills was needed. Until then, power was supplied by water in the shared mill lade fed from the River Tweed and used to turn breast wheels. Combined, the power derived from these sources was around 110 horse-power. It was necessary to produce 450 horse-power for the mills' requirements. Bovey and Co, Ltd. (56 Kingsway, London) were consulted and came up with a scheme that relied on the mechanical storage of power; that is storing surplus energy when it was not needed. A reservoir sited high on the hills would be capable of holding 3,500,000 gallons of water when full and took 132 hours to fill from empty. Water flowed down the hill via the high-pressure pipeline when needed and fed a pelton turbine, which had its own generator and produced an additional 230 horse-power. This power when added to the power produced by the low-pressure turbines gave the necessary horse-power for the whole factory complex. At night (when the mill was not in operation), surplus power was used to pump water back up the hill into the reservoir. To achieve this, the belts coupling the low-pressure turbines were moved across to the pump pulleys and the pumps started to return the water up the hill. All the concrete used during the construction of the reservoir and tower was prepared on site and was hauled up the hill by means of a purpose built funicular railway. 400 tons of cement, 100 tons of reinforcing bars and over 3000 tons of aggregate was used for the construction. The total weight the railway pulled up was estimated at approximately 3,650 tons. During construction, the reinforced side walls were tied into the floor and any local strain is borne by the construction as a whole; it was not rigid but yielded gradually to the pressure of the water when full. A 12in.water pipe leads from the reservoir and follows the contour of the hill until it meets the tower. This tower houses a surge tank, which was big enough to compensate for sudden variations in the water demand. It is also here the pipe changes to a 9in. diameter one (again subterranean). It continues its journey down the hill to the mill lade. All the pipe work is steel riveted with great care taken on joint flanges. The scheme was a success and was used to supply power to the mill for over 25 years. The mill eventually became hooked up to the National Grid and its hydro-electric scheme became obsolete. 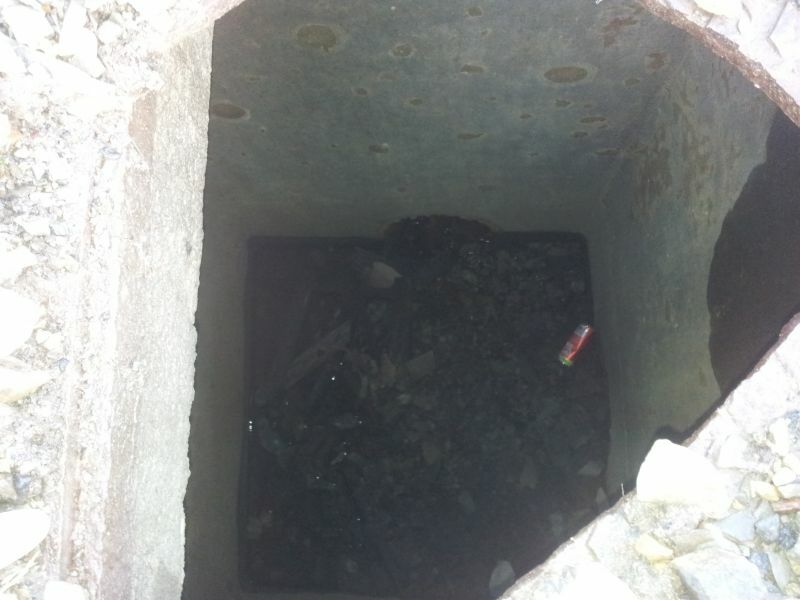 With the reservoir no longer being used, a hole was blown in the side of it to prevent it from overflowing or potentially giving way and flooding the village and valley below, as well as preventing potential drowning accidents. Unfortunately, the hole is where the name of the reservoir used to be. The reservoir is listed due to its importance as the water storage for Scotland's first pumped storage hydroelectric scheme. It is also a testament to the engineers and workers who carried out the construction of such a groundbreaking scheme on difficult terrain.